In the era of big data, enterprises often found themselves with a lot of business data getting generated on a regular basis. A huge volume of data comes with a plenty of challenges. Challenges like high storage cost, application performance, security, scalability, compliance & governance are prompting Salesforce admins to look for an efficient approach to manage their Salesforce data. Data archiving has been proved to be one of the most effective approaches when it comes to managing Salesforce data growth and storage space. If we see the current data archiving industry trends, companies are actively looking for enterprise-level data archiving solutions to store their historical data in order to efficiently respond to legal discovery requests and compliance audits, ensure compliance with government and internal record retention policies, improve primary application and storage performance and reduce additional storage cost. Salesforce customers always look for suitable data archiving solutions, as a larger trove of additional data comes with a big storage price. Currently, Salesforce customers can archive their historical data using three options; On-premise, Cloud (SaaS) solutions, and Native solutions. However, before choosing any archiving solution, it is always good to consider various aspects of your business and data related requirements. There are basically three perspectives before choosing an ideal Salesforce data archiving approach. 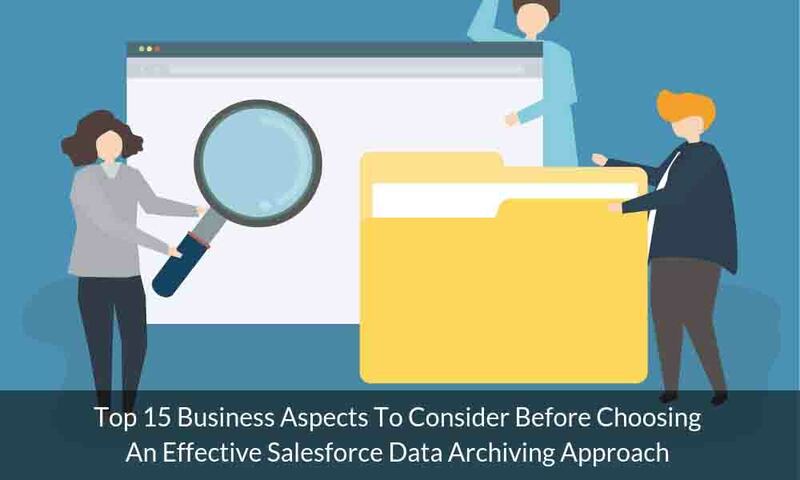 In this blog, we are going to discuss what are the top 15 business perspectives to consider before planning for your Salesforce data archival approach. It is very important to understand the nature of your business and the level of your data sensitivity. As we already mentioned above, data archiving offers three kinds of solutions; On-premise, Cloud-based, and Native. Before choosing any solution you must consider how sensitive your data is. If you are dealing with critical business data or from industries like Healthcare, Financial, or Government then it is always recommended to go for a native archiving solution as your data will reside within your Salesforce platform. This will keep your data security intact. Data retention has become an extremely important factor for various industries to support critical business decision making as well as to ensure compliance with government and internal record retention policies. This is one of the biggest driving factors before choosing an archiving solution. There are various cost factors associated with a solution. You need to consider all these aspects such as software cost, infrastructure cost, renewal cost, upgradation cost, support & maintenance cost, implementation & initial data migration cost, training cost as well as integration cost before planning for your data archival solution. If you want to turn your data into a competitive advantage, then you need to apply analytics on your archived data. Before going for an archiving solution, you must evaluate how well the solution can support analytics and can offer you essential business insights. Easy data accessibility is one of the important business factors while considering your data archiving approach. Your archived data must be available whenever you want without much hassle. Data is a valuable asset for any business and a key to growth. It needs to be protected from unauthorized access to prevent it from possible ill-usage. You need to consider the security aspects of any archiving solution before taking a final call. Even you have to ensure the security of the data after being archived (who can access the data). Native solutions are the best when it comes to data security as they will keep your data within your Salesforce Org without sending it outside. There are certain industries like healthcare, financial, government etc. who need to follow various data regulatory policies (Federal laws, CFR Part 11, HIPAA Standards etc.) and have to retain their data as per these policies for a certain amount of time. If you are a part of an industry which needs to archive & retain data as per a certain policy, you must look for a solution which can support that. This is a very vital aspect of choosing a data archival solution. Application switching refers to changing your currently used archiving solution in future if business demands. For example: If you are using a cloud-based solution now and wants to switch to a native solution, or if you want to switch from one cloud platform to another cloud platform. You need to consider factors like what will happen to your archived data, what will be the additional cost, what will be the exit cost, whether your current vendor is offering this facility or not etc. It is very important to consider factors like implementation time, cost, and complexities while selecting the best Salesforce data archiving approach. There are solutions which require a long period of time (months) for implementation, whereas native solutions like DataArchiva takes only a few days for implementation. Just like implementation, you need to consider factors like initial data migration time, cost, and complexities while deciding for an ideal data archiving approach. It is important to know how an archiving solution is going to perform. Performance includes factors like scalability, data storage & transformation security, data integrity, how much data the solution can handle, how much time it will take to archive a certain amount of data etc. It is always recommended to check the “Performance Benchmark Report” of the application before making the purchase decision. If you are dealing with a huge volume of data, it is always wise to go for a solution which offers bulk archive and restore options. Enterprises today use multiple third-party applications to perform various business operations to save time and cost. Your Salesforce data archiving solution must have an integration facility (API) to work with external solutions like any AppExchange applications, or other Cloud (SaaS) based applications. As an archiving solution is going to deal with your business data on a regular basis, it is important to have a service provider who can offer prompt service whenever required. It is always advisable to check the credibility of the service provider and the application on various platforms (website, AppExchange reviews, social channels etc.) before consideration. Evaluate the modes of support (chat/call/email) and set your preferred support approach. Managing Salesforce data growth and storage has now become easy and cost-effective. You need to have the right strategies and approaches while considering the most convenient data archiving solution for your Salesforce Org. In this blog, we have highlighted all the business aspects to consider before going for a data archiving solution. In our next blog, we will discuss all the technical aspects which an enterprise should consider while looking for an ideal data archiving solution.